23 December 2012 - May you and your loved ones enjoy the true meaning of Christmas and have a prosperous New Year. Let's all give thanks for what we have and pray for a more peaceful year in 2013. 20 December 2012 - Michael Pearson has released his fourth group of Mirage III/5 AI aircraft. The subject is the Mirage 5BA/BR/BD of Belgium. While continuing to work on new Mirage III and Mirage 5 AI versions Michael Pearson is also improving the AI flight model. He has issued an update to the flight model as well a few visual updates. 17 December 2003 - I put up the annual Holiday Season's Greeting on the Home page. I found a nice winter looking image of a Mirage 2000D at Exercise Joint-Winter 2003 in Bodo, Norway. The image is from the Escadron de Chasse 2/3 Champagne website. 14 December 2012 - The third group of Mirage III AI aircraft from Michael Pearson are the Armée de l'Air Mirage III trainers, reconnaisance, and ground attack versions. He has released packages for the Mirage IIIB, IIIBE, Mirage IIIR, IIIRD et Mirage 5F. 10 December 2012 - Michael Pearson has released his second group of Mirage III/5 AI aircraft. The second subject is the Mirage IIIE and export versions in nine packages for France, Argentina, Brasil, Spain, Lebanon, Venezuela, and Switzerland. Two of the packages for Abu Dhabi/United Arab Emirates and Egypt are of the Mirage 5 based on the Mirage III airframe. He has also issued an update for the flight dynamics files of all packages to date. 6 December 2012 - Marc Renaud had created camera view definitions for use with the Rafale M of Bruno "Thor's Hammer" Mérelle. 2 December 2012 - Michael Pearson has released the first of his Mirage III AI aircraft. The first subject is the Mirage IIIC in four packages: Armée de l'Air, Israel Defence Forces, Fuerza Aerea Argentina, and South Africa Air Force. He has also issued an update for the flight dynamics files of these first packages. 24 November 2012 - Marc Renaud had created camera view definitions for use with the Rafale of Cyril Pioffet, Anthony Douglas and Vladyslav Pavlyuk. 21 November 2012 - Since the Avsim website and library were damaged several years ago many of the links to the Mirage repaints of Mike Pearson have been broken. Mike has re-uploaded 95 of his previously released FS2004 repaints of the Mirage III by Warwick Carter and the Mirage 2000 by Roland Laborie. 16 November 2012 - Michael Pearson continues to work on his AI series of Mirage III/5 aircraft. He has sent some images showing several of the schemes he is painting. I have added them to the preview page. He also sent me examples for a closer look. 11 November 2012 - Marc Renaud has created new camera view definitions for use with the Mirage 2000 of Roland Laborie, the Mirage F1 of Kirk Olssen, and the Super Etendard Modernisé of Romain Lucas. 30 October 2012 - Geoffrey de Kergariou has painted additional textures for the Étendard of the Royale French Navy Design. These new textures represents several Étendard IVM and Étendard IVP. Only the textures are included so you will need to download the Étendard IVM/P. 15 October 2012 - Danny Garnier has made another attempt at bringing the Mirage F1 of Kirk Olsson into FSX. This new attempt uses more recent gauges and Kirk's replacement canopy textures. 7 October 2012 - Michael Pearson is working on a new series of AI aircraft. They will be based on new Mirage IIIC, IIIB, IIIE, and Mirage 5 models he is developing. The series will not be limited to Armée de l'Air subjects but expand to include many export versions as well. There will be a lot of opportunity for new scenery/AI packages. 22 September 2012 - Years ago a group of developers came together and created a flight simulator program known as FlightGear. The program is still under development and remains "open source" and free to all. There are several Dassault fighter aircraft available for the game and I have put together a display page for them. 17 September 2012 - Among the scenery available for FS2004 and FSX on Beat Shafrir's new website are several Swiss Air Force airbases. I have added some of these to the scenery pages including Payerne (LSMP) and Meiringen (LSMM). 7 September 2012 - After Jacques Santi, who played Lt Tanguy in the late sixties TV series Les Chevaliers du Ciel adapted from the famous comics The adventures of Tanguy and Laverdure written by Jean-Michel Charlier and Albert Uderzo (and later on Jijé) of Pilote magazine, Lt Laverdure, incarnated in the series by Christian Marin has passed away at age 83 this past Wednesday. This TV series and the comic books that inspired it made the Mirage IIIC and later the Mirage IIIE, popular amongst the teenagers and inspired, without doubt, many pilot careers. That is why the Armée de l’Air was represented at his burial. 27 August 2012 - Beat Schaffner has remade his website to make available all of his flight simulator aircraft and panels to display his collection of Swiss Air Force aircraft cockpit and walkaround photos including the Mirage IIIS and IIIRS. He has also made available his scenery for FS2004 and FSX of Swiss Air Force bases. 11 August 2012 - Thinus Pretorius has released a new Atlas Cheetah C for FS2004 and FSX. Several external loads are possible by adjusting the fuel and payload numbers. An updated instrument panel is also included for both versions. 28 July 2012 - Beat (Isra) Schaffner has completed the v2 update to his Mirage IIIS. This version includes many updates as well as an early IIIS in bare metal before the midlife upgrades. He has also completed his Mirage IIIRS. Both aircraft are for FS2004. Isra has also made a new Mirage IIICJ with Israel Defence Forces markings and weapons. 25 July 2012 - I have found two new repaints for the Rafale. Both are of the 30,000 Heures de Vol scheme flown at Le Bourget last year. The first is by an unknown repainter for use with the FS2004 Rafale C by Cyril "Gator" Pioffet. The second is by Brice Garros for the FSX Rafale by Bruno "Thor's Hammer" Mérelle." 20 July 2012 - SkyDesigners have released a new scenery package for FSX. The subject is BA 118 - Mont de Marsan (LFBM) . The scenery includes a photorealistic base with accurate AFCD and airfield buildings modeled from real world photos. 1 July 2012 - Ron Zambrano of Razbam had previously mentioned that his company was going to make a series of Mirage F1 for FSX. He also told me they had plans for the Cheetah C. He recently posted an early work in progress (WIP) image of the Cheetah on his Facebook page. 23 June 2012 - The Military AI Works (MAIW) have released two packaged for the Royal Australian Air Force (RAAF) that will be of interest to RAAF Mirage fans. The first (RAAF Williamtown Hornets) includes airbase scenery for RAAF Williamtown (YWLM). Williamtown was formerly home to the Mirage IIIO units of 3 Sqn, 75 Sqn, 76 Sqn, 77 Sqn, and No2 OCU. The second package (RAAF Tindal Hornets) includes airbase scenery for RAAF Tindal (YPTN) and RAAF Darwin (YPDN) as possible destinations. 14 June 2012 - The Military AI Works (MAIW) have released an AI package for the French Alpha Jets based at Base Aerienne Cazaux (LFBC). The package complements the previous Belgian Alpha Jets package and includes repaints, flightplans, custom call signs, AFD’s and scenery. 6 June 2012 - Thinus Pretorius is working again on his Cheetah C and Mirage IIICZ. He has sent some images of the aircraft and panels. Images of both aircraft are below. 25 May 2012 - GSNext have released a new scenery package for FSX. The subject is Beauvechain AFB (EBBE) in Belgium. The scenery includes custom buildings, custom aircraft (F-104, F-16, and AlphaJet), and the entire base is textured in photorealistic quality. 19 May 2012 - I've been emailing back and forth with Beat Schaffner over the past couple of weeks about a side project he decided to undertake. He has taken his Mirage IIIS/RS and made some alterations to come up with a new option, a Mirage IIICJ. He has added a preview page with a couple images on his website. Also, as soon as the manuals are translated he will release his updated Mirage IIIS and new Mirage IIIRS models. 12 May 2012 - Hani Michal has painted another set of textures for the Etendard IVM by Sylvain Parouty. This fictional repaint is in the markings of the Brazilian Navy to go along with his previously released Sao Paulo (former Foch aircraft carrier) in Brazilian Navy markings. Only the textures are included so you will also need the base Etendard IVM aircraft. 6 May 2012 - Jose Armando Yanez has painted three texture sets representing Mirage aircraft of the Fuerza Aérea Venezolana. Included are a Mirage IIIEV for use with the Mirage III of J.E. Narcizo. He has also painted a Mirage 5EV and a Mirage 50EV. Both are for use with the Mirage 5 series by Eduardo Fadul. 1 May 2012 - Hani Michal has painted new textures for the Etendard IVM by Sylvain Parouty. The fictional repaints are named Red Star and Black Star. Only the textures are included so you will also need the base Etendard IVM aircraft. 25 April 2012 - Hani Michal has created new textures for the Foch by Sylvain Parouty to convert it to the Brazilian carrier São Paulo (A12). Textures are also included for the onboard Alize, Crusader, and Etendard IVM aircraft. The package also included routes along the Brasil coast for the FSX AI moving boat. 14 April 2012 - A friend wrote to invite me to join a new forum and see the new Mirage 2000C that he and a group of developers from Canada and the USA are working on. See for yourself at metal2mesh.com. 4 April 2012 - Alexandre Remy has completed a new scenery package for Base Aerienne Cazaux (LFBC) for FSX. The package features photorealistic textures and sounds as well as static aircraft: Rafale, C-160, Mirage 2000, Puma, and Singapore A-4. 25 March 2012 - To avoid any trouble from Dassault Aviation related to copyright Bruno Mérelle and the Force Aerienne Virtuelle France website had removed his Rafale for FSX from their download pages earlier this year. The file has now been made available again. 13 March 2012 - Michael Roberts has updated the original FS2004 IAI Kfir series by Eduardo Fadul for use in FSX by replacing old gauges with new ones compatible with FSX. The package includes 45 aircraft texture and model combinations. 7 March 2012 - Beat Schaffner has almost completed the update to his Mirage IIIS for FS9. He is working on the manual now and after reading it I can report that this version has even more features than the original. He has also posted some new preview images of his Swiss Air Force Mirage IIIRS project on his website. I have seen this aircraft as well and it is very nice. 1 March 2012 - Tom Zimmerman (aka Blackbird) has been working on smoothing out the flight model of Roland Laborie's Mirage IVP. The changes result an aircraft that is more managable in level flight and especially in low level flight. Tom has also suggested options for the afterburner effect using other aircraft you may already have in your hanger. 20 February 2012 - GSNext have released a new scenery package for FSX. The subject is Hsinchu AFB (RCPO). The scenery includes a photorealistic base and aircraft (Mirage 2000-5Di and 2000-5Ei) of the Republic of China Air Force (ROCAF). 3 February 2012 - The Rafale by VPA may soon be released after a month of delays waiting for Dassault Aviation authorization. The situation has been covered on several French language blogs; Korben, Zone Militaire, and Armée Media; as well as SimOuthouse forum. It is a nice model so fingers crossed. 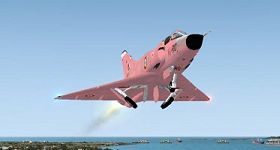 30 January 2012 : Since the Avsim website and library were damaged many of the links to the Mirage 2000 repaints of Mike Pearson have been broken. I have repaired some with my own files but did not have copies of them all. Mike has re-uploaded them to Avsim and I have updated the download links. 21 January 2012 - Restauravia have announced in the forum at pilote-virtuel that they have been working on a new series of the Mirage III for FSX. Included will be the Mirage IIIB, IIIC, IIIR, IIIE, and IIID for FSX! If their Mystère IV is any indication, this series will definitely be a very nice addition to the sim. 11 January 2012 - Fabrice Kauffmann has reworked the Rafale C of Cyril Pioffet (Gator) to include a new 2D panel. All available effects and fixes found on the internet have been integrated and two new textures are included. This package breathes a lot of extended life into Gator's original. 4 January 2012 - Aaron Haase has painted another set of textures for the AI Mirage 2000C of Fernando Martinez. The textures represent an aircraft in special markings from the 2011 NATO Tiger Meet. Only the textures are included so you will also need the base Mirage 2000C aircraft. 1 January 2012 : Happy New Year!